Here Unearthly is featured on the YA Recommended Reading Shelf. I'm sensing an angel theme. 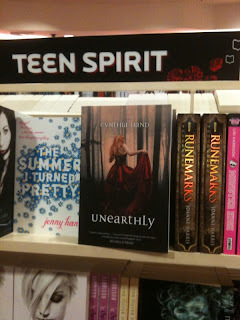 . .
And here it is in the regular YA section. I like that the heading on the shelf is Teen Spirit. 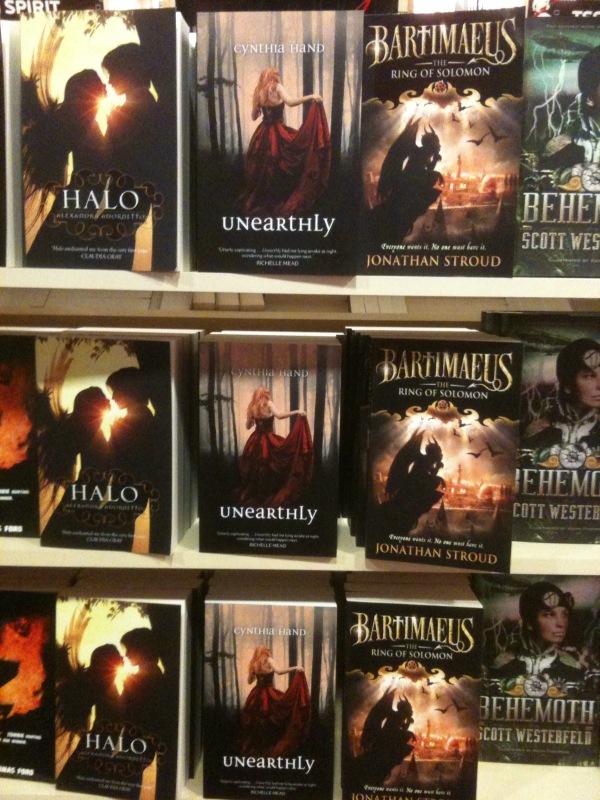 What a rush, to see my book on the actual shelf! And only 2 weeks from today, I'll be able to see it there in person! Woohoo!!! Ahem. So, second thing--my official HarperTeen trailer is live! Now back to cracking. . . The trailer is so pretty! Love the trailer. I am an Australian fan and it is in all the stores, yay! wow! that's a lot of great news! And LOVE the website. And the feathers. All of it. So exciting! im from aus nd i went to the shops with my brother on boxing day (cos his gift was to take me shopping) and i walked into Dymocks and your book was the first one i picked up and thought "I HAVE TO BUY THIS!". so i bought it, and started reading it like yesterday, and i JUST finished and omg im in LOVE! and absolutley cannot wait until your next books come out! oh, and p.s. i was cyring when i thought Tucker was going to die! and i always had a sneaking suspicion that Christian was Part-Angel! I live in Australia. The books on the shelf beside yours are - Halo, by a young Aussie writer - she's just finished high school and this would be about her fourth bestseller! 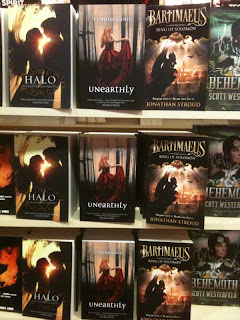 - and the other two books are steampunk (one about a demon, not an angel). My review of your book is up on my blog, The Great Raven, if you want to look at it. I had to work quickly because the girls at my school are all keen to read it and I only managed to get it home by promising faithfully they could read it after the holidays. Good luck with it!